For just over a hundred years a factory existed in Alvarado that took simple sugar bets and turned them into refined white sugar. The factory was really a number of factory buildings that were built over the years, from a simple small wooden factory to a large all-metal factory with an iconic 200-foot smoke stack. The factory was founded by Ebenezer H. Dyer and his family built and ran the plant for a number of years. 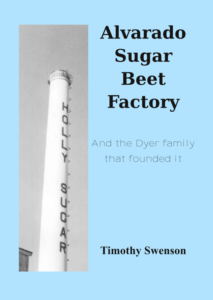 From this, E.H. Dyer created a business of building sugar beet factories around the world. 112 pages.